Given the propensity for changes in spelling of names, this does appear to be the man. His mother may well have given his name for the Burrough Green memorial (but spelled WALLACE) and his grandmother or uncle put him forward under his legal surname for the Great Bradley memorial. 1891 census...Aged 1,he was at Newmarket Road, Great Bradley with his grandfather Richard WEBB  musician born Great Bradley; his grandmother Harriet  born Cowlinge; great uncle George WEBB 38] musician born Great Bradley and cousin Luke WEBB  farm labourer born Little Thurlow. 1901 census...Aged 11, he was "Below the Hill", Great Bradley with his great uncle George, now a farm engine driver, and his widowed grandmother Harriet. 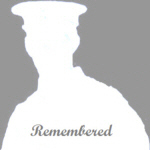 1911 census...He has not been found in this census but he was more than likely overseas with the Suffolk Regiment as his service number is compatible with entry in 1908.. 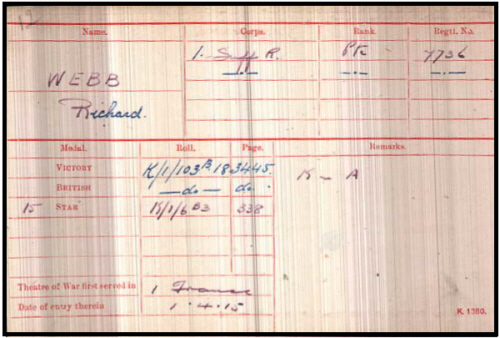 It seems he is the Richard J Webb who married Alice A SPARKES in 1915 (Newmarket Q1-1915 3B:812) since his sole legatee is recorded as widow Alice Ann. 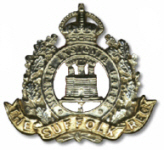 Lt Col Murphy's "History of the Suffolk Regiment" tells us that the understrength battalion on 24th May 1917 marched from billets in Herzeele, towards Ypres. The main bridge over the canal was being heavily shelled and Lt Kemble led the battalion over the canal via a small pontoon bridge. 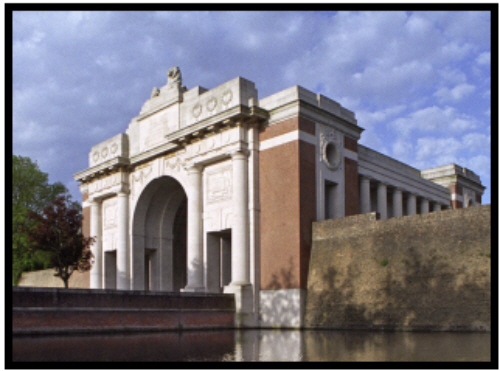 They then cut across country, round the pond at Zillebeke to Witte Poort Farm, suffering a few casualties on the way from shelling. In front to the farm was a sunken road and a deep ditch beyond which a field at the far side of which the Germans were entrenched. The Suffolks, from crouching in their ditch began to push their way through the hedge and attack the German line.They were instantly met by a deadly fire from the Germans, thinning the line so that the line was never reached and they therefore retired. The Brigadier then commanded that Bellewarde Farm was to be taken at all costs and at midnight they again moved up to the west of Witte Poort Farm, but out of touch on both flanks. The order to advance was given but the result was again to be met with withering fire and failure.